There have been a string of successful attacks on certificate authorities (CAs) this year, and the threat to CAs will certainly not abate. On the contrary, hackers have been raising their game steadily and the techniques used to exploit networks grow ever more sophisticated. 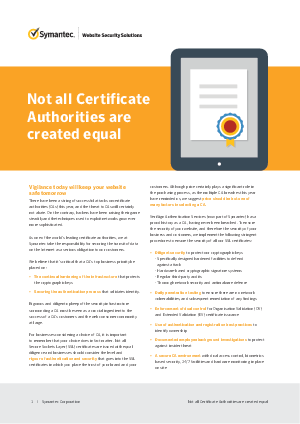 As one of the world’s leading certificate authorities, we at Symantec take the responsibility for securing the transit of data on the Internet as a serious obligation to our customers.